Our team has been carefully selected for their expertise in their field and for their exceptional dedication to serving our patients. 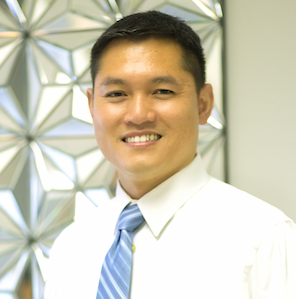 Dr. Trung Ngo was born and raised in the heart of the midwest in Indianapolis, Indiana. He grew up a huge sports fan and attended Indiana University at Bloomington for undergrad. Majoring in Biology, he graduated and decided to further his education with his Masters in Biology at Purdue Indianapolis. After completing his Masters in 2000, he decided to relocate to sunny California to figure the next step in his life. One of the things he looked into was the dental profession and he volunteered at a free clinic in Share Our Selves in Costa Mesa. He liked the idea that it combined his passion for art with the ability to help people. At that clinic he met another volunteer, his friend and now practice partner Derick Nguy and the rest you can say is history. Fast forward almost 20 years and Dr. Ngo has graduated with a degree in hygiene and one in dentistry at the prestigious University of Southern California. He was part-time faculty at USC from 2004 through 2010. He met and became an associate for Dr. Dana Rockey and worked with him until Rockey handed the practice to Dr. Ngo. Continually striving to get better he and his team take continuing education to be on the current edge of dental technology. With a team of Dr. Derick, the best hygienists around and a caring staff, Empresa Dental caters to giving patients dental therapy with thought and care. Dr. Ngo is an adoring husband and doting father. He loves sports, fantasy sports, collecting sports memorabilia, traveling, art and considers himself an amateur “foodie”. 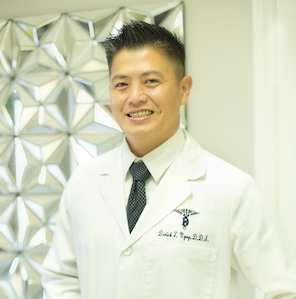 Dr. Derick Nguy is a calm, passionate and caring doctor who prides himself on his ability to provide a peaceful and tranquil environment for his patients and their families. He has built his practice to reflect his serene nature. His passion for technology has fueled his drive to continue to learn and develop a state-of-the-art dental practice with the utmost regard for patient care. He has crafted a technologically advanced office to keep patients at ease and bring forth cutting-edge techniques to create the perfect smile. With a strong dedication to education, he earned his Bachelor of Science degree from the University of California, Irvine. Dr. Derick completed his studies in dentistry at the University of California, Los Angeles in 2005. Dr. Derick is a loving husband and dedicated father to his beautiful daughter. He likes to spend his free time with family and friends, loves good food, and enjoys playing basketball. Jennifer was raised in California. She began her dental career as a dental assistant in 1991 and earned her Registered Dental Assistant license in 1994. Given that Jennifer drives over an hour to get to our office, we are grateful she has worked in our office for over five years. Although in a previous life you could find Jennifer skiing and teaching snowboarding, her current passion is the raising of, the caring for and the showing of miniature horses. This love has taken her and her husband across the country to collect the numerous awards they have won. Karen grew up in Fountain Valley, California. After she graduated from Saddleback College with an AA degree, she studied for and obtained her Registered Dental Assistant license. Karen earned her RDAEF (extended functions) credential from UCLA in 2005. She also holds an AA degree, along with X-ray and Coronal Polishing licenses. Karen has been practicing in the dental field for thirty years. Karen is married with two collegiate children. She enjoys water skiing, camping and going to dinner and a movie with her husband. Alex grew up in Norco, California also known as Horsetown USA. She attended a private RDA program at Riverside County ROP and received her Registered Dental Assistant Licence in 2012. She started off as an intern assisting Dr. Derick and has remained his assistant ever since. ALex has experience with assisting specialty procedures as well which are her favorite, especially Oral Surgery. On her free time she enjoys traveling, going to the gym, and spending time with her family and friends. Jo Ellen grew up in Walpole, Massachusetts. She attended Boston University, Northeastern University and the Forsythe School for Dental Hygiene. In the process, she earned her Dental Assisting and Dental Hygiene Credentials, along with an AA Degree and her BA in Health Sciences. In 1988, she moved to California and obtained her California Registered Dental Hygiene License in 1989. Jo Ellen has been practicing in the dental field for over thirty years. Jo Ellen is married with three children. She is also the proud parent of three dogs. She loves traveling, with cruising being her preference. She, of course, is a huge Boston Red Sox fan. Mary is a California native who grew up in Rossmoor and Los Alamitos, California. She graduated from Cypress College in 1994 with an AS Hygiene Certificate Degree. She has been practicing in the dental field over fifteen years. Mary has been married to her husband Pat, a real estate broker, for forty years, and has two grown children. She and her husband enjoy traveling, especially by cruise ship, and are very involved with their church, The Self-Realization Fellowship. Her hobbies include swimming, calligraphy, reading and cooking. She has a cat Zara. Shelley attended Dental Hygiene school at West Los Angeles College and graduated in 1988 with her Registered Dental Hygiene Degree. She did her clinical work at the UCLA School of Dentistry. Shelley has been practicing in the dental field for more than twenty years. Health and wellness are Shelley’s passion. In her free time, you will find her at the gym or on the soccer field. She lives in Ladera Ranch with her husband and three children.